Miskatonic University has a long-whispered reputation of being strongly connected to all things occult and supernatural. From the faculty to the students, the fascination with other-worldly legends and objects runs rampant. So, when Carter Weston’s professor Dr. Thayerson asks him to search a nearby village for a book that is believed to control the inhuman forces that rule the Earth, Incendium Maleficarum, The Inferno of the Witch, the student doesn’t hesitate to begin the quest. When you think of a supernatural book, what is the first thing that comes to your mind? The Twilight phenomenon? Harry Potter? I was really intrigued simply by the cover of this book. I once dated a guy who was slightly obsessed with Cthulhu, the ancient one resting at the bottom of the sea. 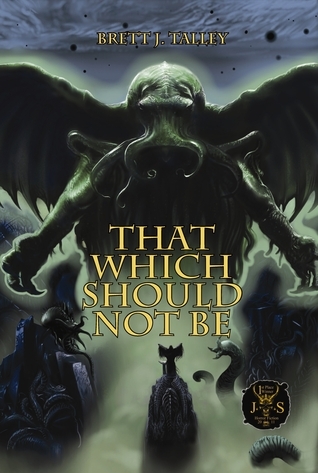 The image of Cthulhu immediately grabbed my attention, but I had no idea what i was getting into. This isn't just one story, but the story of a man who, along his journey, was told other amazing stories. After being asked to look for a long-lost, ancient text that had recently surfaced in another town, Carter Weston meets four men in a tavern that each have an amazing and unbelievable tale to be told. His quest for the book and the tales he learns are just the beginning of his adventure. I honestly can't believe how wrapped up I became in this story. It wasn't just the need to finish it, but the need to know what is next. I would lay in bed after reading for a while and my mind would simply race, replaying all of the adventure again and again. This is an amazing adventure story, and I don't know if anyone else could have told it as well. I simply can't explain how amazing this book really is, but it left me wanting more.